Competitors woke up before dawn to 17-degree temperatures to start Day 3 of the Rebelle Rally presented by Hoehn Adventures in Diamondfield, Nevada. 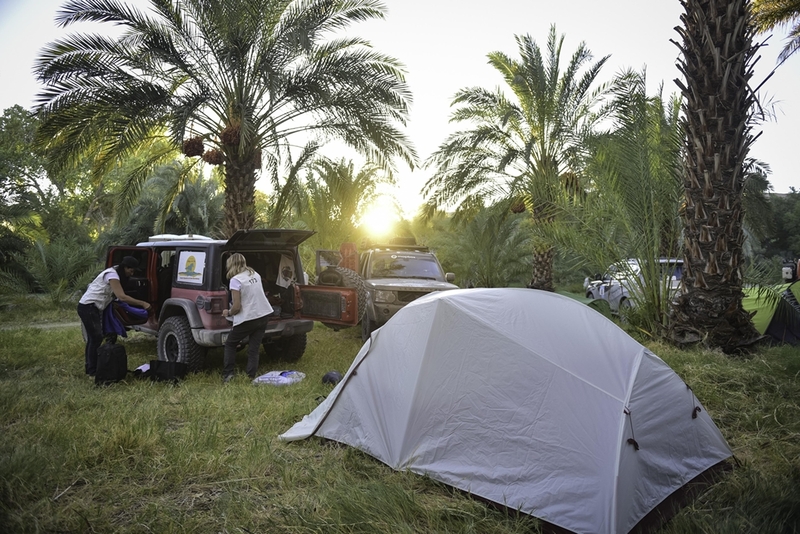 The route started with a Rebelle Enduro Challenge (REC) to Goldfield, and the crossover competitors stopping at the cool and quirky International Car Forest of the Last Church. From there the route continued south to Rhyolite, another of Nevada’s colorful ghost towns. In 1907 Rhyolite was considered cutting edge with electric lights, water mains, telephones, newspapers, a hospital, a school, an opera house, and a stock exchange. The population was estimated at 5,000 in 1907, but by 1920 it had plunged to nearly zero. From Rhyolite the route skirted along the top-secret Area 51, where the government tests experimental aircraft and weapons systems. The teams used their decidedly more old school navigation systems to arrive at Amargosa Dunes. This dune system covers five square miles and rises up to 500 feet tall, just large enough for competitors to air down their tires and get a taste of what is to come. While the dunes seemed benign, more than one team fell prey to the soft sand and challenging CPs found on Day 3. The standings started to spread out on Day 3, with Team Blondetourage #125 (Teralin Petereit/Kaleigh Hotchkiss) earning the most points for the day in the provisional standings of the 4×4 Class, moving them back into first place in the overall standings. They lead Team Hoehn Adventures #109 (Jo Hannah Hoehn/Susie Saxten) by nine points and Team #140 (Emme Hall/Rebecca Donaghe) by ten points. In the Crossover Class, Team Hoehn Porsche #202 (Lisa Wolford/Sandy Conner) posted the best score for the day to hold off Team Naviguessers #210 (Emily Winslow/Alicia Farrar) in the provisional standings for the event. Scoring for the marathon stage (Day 3 and Day 4) will not be finalized until all teams return to Base Camp at the end of Day 4 and meet with scoring officials. Tomorrow marks the second half of the marathon stage, with teams transiting through the Mojave National Preserve on their way to Johnson Valley OHV Area, where the competitors with face the Rebelle Rally’s first ever night stage! Daily Tech Tip – Why Is The Start Order Random? Born in 1936, Suunto has always been committed to accuracy. Not satisfied with the accuracy of traditional dry compasses and their lack of steady needle operation, engineer and Suunto founder Tuomas Vohlonen discovered and patented the production method for the liquid-filled compass. This made for a much steadier needle, better readings, and a whole new level of accuracy. Since then, Suunto has been at the forefront of design and innovation for a variety of instruments used by adventurers all over the globe. Suunto’s MC-2 G Mirror Compass is the compass of choice for Rebelles who understand that the difference between success and failure when looking for that unmarked black CPs in the dunes comes down to a matter of feet. When precision matters, we choose Suunto.